A six-week expedition with Sea Education Association (SEA) to the Phoenix Islands Protected Area (PIPA) is underway. 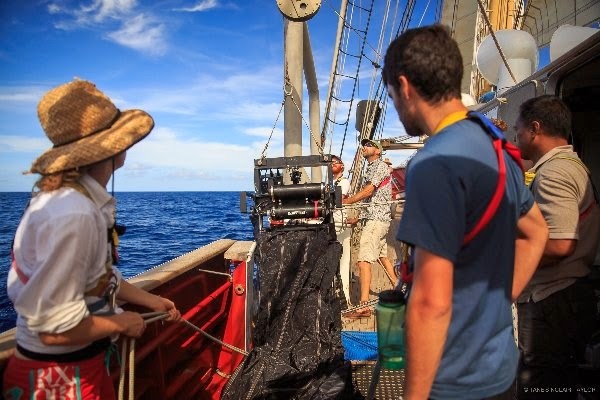 This will mark the first-ever oceanographic cruise to PIPA, and is a historic collaboration between SEA, the New England Aquarium, Woods Hole Oceanographic Institution and the Republic of Kiribati. The objectives of this mission include the high-quality education of 13 students in both science and policy aspects of PIPA as well as scientific goals, which will be detailed in the coming weeks and months here on this blog. As we close in on our crossing of the equator, we experienced our most exciting day today in all aspects of ship life. Throughout the first two weeks, we deployed two different scientific instruments daily, a Neuston net, a meter wide net that collects zooplankton from the surface of the ocean, and the hydrocast, which is a series of twelve seawater collection tubes that open at different depths. Over the past we days we have been adding a few new instruments. Early this morning we deployed our third Argo float when we crossed the 2.5° parallel. These are similar to the hydrocast, in that the measure parameters of the ocean water at different depths such as salinity and temperature. But these Argo floats part of a network of thousands of robotic floats around the world’s oceans that can raise and lower themselves in the water column, collecting and transmitting data for up to seven years. Later this morning, after a misfire yesterday, we successfully deployed our first MOCNESS (Multiple opening and closing nets and environmental sampling system). It is similar to the Neuston net but much more advanced. The MOCNESS is a series of nets that can be opened and closed at different depths, sampling the zooplankton not just at the surface. Different organisms prefer different depths and conditions so the MOCNESS allows us not only to sample the lower depths, but also to separate out what was caught where. Once we are in PIPA, the MOCNESS will be an important part of our scientific study of the area. The MOCNESS itself would have been enough to make this a remarkable day, with everyone looking forward to its appearance with much excitement. But the MOCNESS pales in comparison to a pod of five or ten pilot whales, the first mammals we’ve seen other than ourselves in two weeks. 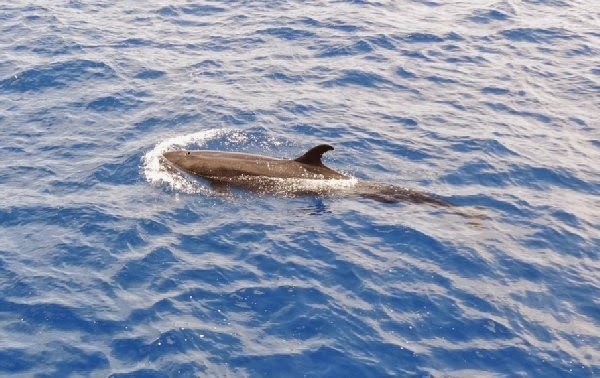 Pilot whales are small whale with very round head, almost swollen looking. On the whale-dolphin spectrum they fall close to the dolphin side, having the general size and shape of a large dolphin. The pod followed behind our ship for close to twenty minutes, coming to the surface and swimming right alongside our ship. A ray was spotted soon after, along with five or six different bird species, making this by far our most biologically active day. After doing our weekly thorough clean of the ship, we were surprised with a swim call from the captain. The waters were calm enough that we were able to stop the ship and all get in the ocean for a swim. It felt so refreshing to wash off and finally get in the ocean. It is pretty cool to think that below us was close to 5,000 meters of water between us and the ocean floor. Early tomorrow morning we expect to make our crossing of the equator. A few days after that we will enter PIPA finally before spending the next three weeks in its waters. Our exact plan for those three weeks is still relatively unclear, as we do not know what conditions will be like and how many landings we will be able to make. But our general plan is to go to Enderbury, Kanton, Orona, possibly a trip up to Winslow Reef, and then Nikumaroro before heading out to American Samoa. We will spend three days on and around each island doing both terrestrial and marine work. Our transit time between islands will also involve intense data collection as we try to get an idea of what the waters in PIPA are like and the connectivity between islands. Since this is the first oceanographic research trip to PIPA that will be our primary research focus while we are there. But there are still many more miles to go before we arrive, including an equator to cross. SEA 2014: To sea! With SEA!